This recipe is in an old Polish style – po staropolsku with its use of prunes and honey. I love the flavour of the meat with this sweetness added to it. This is a dish could be served on special occasions such as Christmas Day. This recipe needs a large piece of pork loin which will have some of the prunes placed in cuts on the top. I usually use prunes with the stones still in however in January 2017 there were no prunes with stones on the market in Leeds. 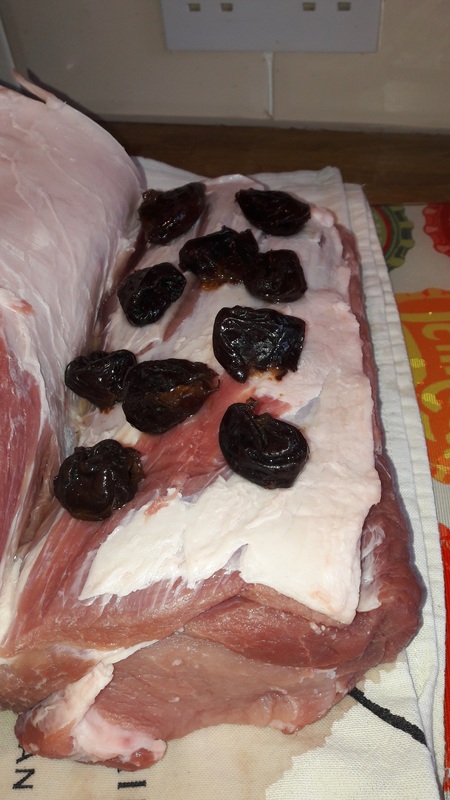 The lady on the stall said this was because of a very poor harvest – so I have used these stoned prunes to try out the recipe for the photographs & this post. You will need a roasting tin with a lid. Pour the stock into a pan and bring it to the boil and then add the prunes and cover these with a lid. Let them simmer gently for 20 minutes stirring occasionally. Allow the prunes to cool so you can handle them and take out the stones. Take 8-10 of the prunes and put them in a dish and pour the sherry over them and leave them for at least 30 minutes. Pre heat the oven to Gas Mark 3 – 1600C. Take the pork and in what will be the top make 8 to 10 deep cuts with a sharp knife. Into each pocket place one of the prunes that has been soaked in the wine. (If your joint has the skin on it then cut under the skin and put the prunes between the skin and the meat). Keep the sherry liquid as you will need it later. Coat the joint with the flour, salt and pepper. In a frying pan, melt the butter, add the oil and on a high heat, brown all the sides of the joint or if the joint is too large for the pan use the roasting pan on top of the stove to fry it in. Put the meat and the frying juices into the roasting tin. Add 6 tablespoons of the stock and cover the dish with the lid and put the dish in the oven for 40 – 50 minutes. Take the dish out of the oven , add the rest of the prunes and the stock, put the lid back on and cook in the oven for another 40-50 minutes until the meat is tender. 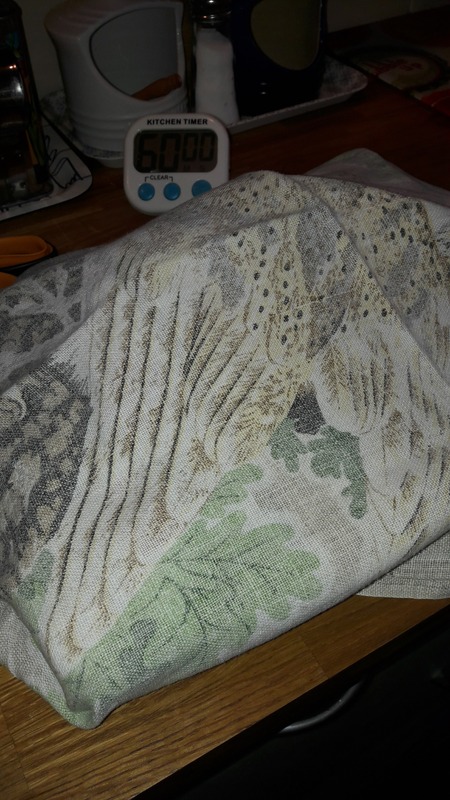 Take out the meat and put it on a warm serving dish cover it with foil and a tea towel and leave it to rest in a warm place whilst you finish the sauce. Take the bouquet garni out of the dish and add the sherry liquid and honey to the prunes and bring this to the boil. Then simmer it gently and use a balloon whisk to blend the sauce together and break up any large pieces of prunes. Pour the sauce into a gravy boat or jug and serve with the meat. I had some of the prune sauce left over and I had decided to cook some duck breasts. I thought why not heat up the prune sauce and serve it with the duck, which is what I did – it was delicious together. So I thought “Why not try to create a prune sauce which can be cooked separately for serving with roast or pan fried meats such as pork, duck or game“. So I did and here is the recipe. Place the prunes in a small bowl and pour the hot water over them and leave them to soak for at least an hour. If using prunes with stones remove these now. In a saucepan melt the butter and add the flour and heat gently stirring with a wooden spoon to make a roux. Slowly add the stock and bring this to the boil, stirring constantly so that you do not get any lumps. Add the prunes and the liquid they were soaked in, the bay leaf and ground black pepper. Simmer gently until the prunes are soft. Add the sherry and the honey and simmer for another 3 to 4 minutes. Use a balloon whisk to blend the sauce together and break up any large pieces of prunes. Pour the sauce into a gravy boat or jug and serve hot with your meat. If possible, depending on how you have cooked the meat , add any meat juices to the sauce, stirring well.